So I went ahead and made a small changed to the cake recipe such as adding almonds, and covered the cake in white chocolate ganache. I know – there is no chocolate inside Raffaello. But I had to use something that would create the effect that I wanted so I had to go with white chocolate. And by mixing some condensed milk into the ganache, it came really close the Raffaello milk cream filling! When I make layer cakes, I usually bake the cake the night before so it can cool completely overnight. It also makes everything more relaxed since you can mess with the baking one day and then focus on the decorating and frosting the next day. For more detailed info, check out this tutorial on How to frost a layer cake. If you have problems with your cake not rising as mine did: The coarser the almonds the more dense the cake will be and the less it rises. I used store bought almond flour and sifted it so I would get a very fine powder. That can make a big difference! You can ground the almonds yourself but make sure to get them really fine and sift them. Preheat the oven to 350°F / 180°C and grease two 6-inch cake pans (they have to be at least 3 inches high since the cakes will rise quite a bit, I would recommend a 6 x 3 inch cheesecake pan). Put the egg whites in a bowl and whisk slightly. Add the ½ cup milk, coconut milk and coconut flavoring and mix thoroughly. Set aside. In a large bowl, combine the flour, almonds, baking powder and salt, set aside. In the bowl of a stand mixer fitted with a paddle attachment, cream the butter and sugar until light and fluffy, about 3 mins. Add the egg white mixture altering with the flour mixture in 3 additions, scraping down the sides of the bowl and mixing just long enough to incorporate between additions. Divide the batter among the prepared pans and bake for about 60 mins or until a toothpick inserted into the center comes out clean. Allow the cakes to cool in their pans for 10 minutes, then turn them out onto cooling racks to cool completely. Whisk the butter on high speed until fluffy. Add the cream cheese and sugar and keep mixing until well combined, mix in the coconut flakes. Set aside. Whisk the egg whites with your stand mixer on medium-high speed. Add the cream of tartar and a pinch of salt. While the egg whites are whisking, start the sugar syrup by bringing the water and 50g sugar to a boil. Once the syrup reaches 230°F / 110°C on a candy thermometer and the egg whites are stiff, pour the syrup into the egg whites while running the mixer on low speed. Increase the speed to medium-high and whisk until glossy, for about 10-15 minutes. The meringue should now be cool to the touch. Cut the butter into cubes and add them one by one with the mixer on medium speed. Add the sifted powdered sugar, then turn the mixer on high speed. The buttercream will start to curdle but don't worry, just keep mixing and it will all come together. After 2-3 minutes the buttercream should be creamy and fluffy. Set aside. GANACHE: melt the chocolate over a double boiler and stir in the condensed milk. Set aside. Cut both cakes in 3 even layers and put the first layer on your cake stand, fixating it with a dab of buttercream underneath. 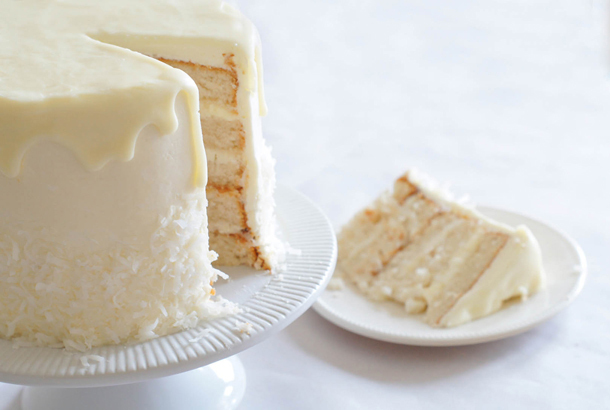 Spread ⅕ of the coconut cream cheese filling on top and cover with the second layer of cake. Repeat this with the remaining 5 layers. Once your cake is assembled, you need to crumb coat it before you cover it in frosting. This is necessary to lock in all the little cake crumbs and keep them from working their way to the surface of your frosting. It pretty much just means applying a thin layer of buttercream on the entire cake. 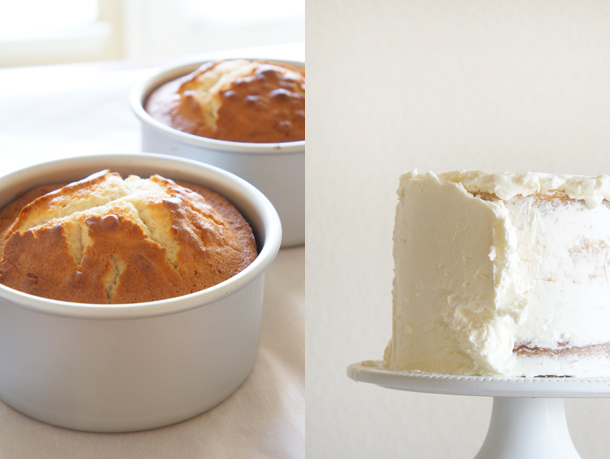 Let the cake cool for at east 30 minutes in your fridge. Frost the cake with the buttercream and decorate it with shredded coconut and ganache. Hi Annalise, thank you, and thanks for the great coconut recipe! Raffaello is a little praline by Ferrero. It is filled with an almond surrounded by a milky cream, surrounded by a waffle and covered in coconut. It is very common in Europe but you can easily get it in the US as well. It’s delicious! wow that is a gorgeous cake! Melina, this is a beautiful cake. I love your tutorial as well. And of course your blog. Great work! This is so lovely – I really want to make it. Not sure who I am going to find to share it with – it’s one enormous cake. The flavour combinations sound fantastic. Now I know what this year’s birthday cake will be. Happy Birthday to me!! Can’t wait. This is so pretty. And yes, it is one enormous cake 😉 But its worth it! Es de locos! Menuda maravilla! Felicidades! I made the cake three times because I made a huge layer cake. The cake was flatter and cracked around the edges. It’s delicious, but a different consistency than your picture. The original recipe had more baking powder. Maybe I should have used more. I bake a lot, but I’m not sure if I am doing something wrong. Is it really 4 sticks of butter for the buttercream? I made it and only put in 2 sticks because it seemed like too much… Still tasted good, but just not sure. Hi, I am not sure what could have gone wrong, did all your ingredients have room temperature? Mine raised quite a bit and got fluffy, as you can see in the pictures in the middle. Did you make sure the oven was all the way at 350F when you put the cake in? I remade the buttercream with 4 sticks…much better!! I was just nervous about messing up. Still not sure about the cake part. It never raised like yours…Maybe the almonds were not as finely ground. I used a coffee grinder. I just don’t know, but it still tasted great! Thanks for posting and responding!! Use a soup spoon to lift cake flour out of the bag and & let it fall into the measuring cup. After reaching the desired amount, sift cake flour 3 times before using in recipe. Often cake batters are beaten too long or at too high a speed & that makes a somewhat dry batter. Cake baking needs a gentle touch with lots of patience. Buttercream isn’t something to skimp on the ingredients & while it also takes time & looks like it’s going to fail, patience wins the day. My first cake (when I was 12 years old) came out of the pan like a brick! OMG, I was so embarrassed & cried my eyes out while my siblings & parents laughed themselves silly. Now I realize that the cake recipe was missing some REALLY important instructions (as if everyone is an expert baker!). My sweet tooth drove me to check several versions of every basic cake recipe from then on & eventually I had all the information I needed to make a great cake! Good luck!!! Is almond meal the same as ground almonds? Such a beautiful cake, great idea to try and incorporate the Raffaello filling. I love those little chocolates. Found you on pinterest and now following. Lovely blog btw. I love Raffaello and decided to give this recipe a try for my grandma’s Birthday. After reading some of the comments, I made sure to follow the recipe EXACTLY—that includes all ingredients being room temp. and oven being 350 F hot. Unfortunately, the cakes didn’t rise. I was able to cut each layer in two, which left me with a more traditional 4 layer cake and was totally fine, since I was going for the Raffaello flavor, not the “sky-high” factor. (Maybe adding baking soda would’ve made it rise, but I’m just guessing…) I ended up needing almost twice the amount of filling and half the amount of icing—but that could be due to my personal preference. So after slight modifications the cake was still a delicious success in the end—very pretty too. Quite rich and heavy I must say and “moist” as Melina describes—not light and fluffy, if that’s what you’re going for. My only suggestion would be to make sure that you use real coconut extract and not the imitation coconut flavoring which they sell at supermarkets, or to make sure that you’re ultimately content with the smell of flavoring you’ll be using. I used the latter and my cake ended up smelling more like Malibu rum—not a delicate Raffaello scent. Great recipe, though! Thank you, Melina! Oh, this was delicious! Since you baked it in small pans, it makes it quite high and that is really necessary to get the desired visual effect. I used 9 inch pans and even though I split the layers, it was only 3-4 inches high and it didn’t look quite a beautiful as yours–of course it tasted fabulous and after a bite, I was able to forget my disappointment in how it looked in about one second! Thank you! As for the almonds… the more corse the almonds the more dense the cake gets and the less it rises. I used store bought almond flour and sifted it so I would get a very fine powder. That can make a big difference! You can ground them yourself but make sure to get them really fine and sift them. This cake is looking a little too perfect right now. I have included it in my to bake list. Wanted to find out if anyone has ever made it as cupcakes and how did it turn out? That link on How to frost a layer cake is not taking me to it. Also, can I just cut the layers into 2 layers, I don’t think I could cut the layers into 3 even layers. I am so sorry, I edited the link and it is working now, here you go: http://www.sugaryandbuttery.com/how-to-frost-a-layer-cake. Sure you can cut your cake into just 2 layers, that will work just fine! Hi! I baked this wonderful cake last night! While it tasted delicious, I think I may have under baked it bc it was pretty dense. It shouldn’t be that way, right? lol I baked it in 2- 8×3 pans for about 45 minutes. The toothpick came out clean and it had just started pulling from the sides but it was very moist and heavy. We ate every drop of it, lol but I want to make it for others so I know need to do better. lol Any tips? (I used professionally ground almond flour btw) thank you!! It was amazing!! This cake is visually stunning and such a gorgeous idea! My friend and I chose this recipe for her wedding cake and today I have been attempting to make the layers needed to create the sky high effect. Sadly, even with 25 years of baking experience in hand, this recipe didn’t work for me. The cake sunk, was cracked at the top and soggy on the bottom! It was also very dense and felt that there was a lot of liquid ingredients for what should be a lovely fluffy cake. I’m sure it has worked for others, but my 3 attempts with slight tweaks have all ended with cake being thrown to the birds…very sad! Rafaello is one of my favorites and I absolutely love this recipe! How long does it store for once completed? Grüsse aus London. Toller Kuchen. Für die Cream Filling benusst Du sweetened coconut oder unsweetened? white color looking nice in the cake. Thank you thank you so much for this wonderful cake! Hi, I came across this beautiful cake on pinterest and cant wait to make it. I have one question though. If I use almond flour in place of the almonds, is it still one cup? I made this recipe this weekend. It was my first time making Swiss Buttercream, and I made the mistake of putting all of it in the fridge with the cake after I did the crumb layer of frosting. Ugh..The buttercream solidified making it very challenging to frost the rest of my cake. I learned my lesson for next time. I also had a hard time with the ganache. I was wondering if it was because of the thin layer of buttercream that I had, or if the ganache was too hot?? But it just kind of turned into a sloppy mess, and looked unappealing. I was so bummed, but then I just added coconut shavings to the entire cake and saved it! I got TONS of compliments say this was the best cake they have ever had.. Some people that don’t even like cake finished their entire serving while others said after the first bite that they felt like they were on a tropical island. I noticed how dense and moist this cake was. I ground up my own almonds and sifted all the dry ingredients and it made for perfect cake layers. I would like to try to make this cake again, so I can get the ganache part down! Thank you so much for sharing this recipe and bringing joy to lots of tummies! Just curious, what type of coconut flavour do you use? emulsion? or extract? I made this cake last weekend! The cake is dense but moist and amazingly tasty! I did sift the almonds and my cakes rised pretty well. Everyone loved it! Next cake on my list is the chocolate and marzipan one! Can’t wait! I would love to try your raspberry angel cake w/champagne meringue buttercream but can’t find the recipe, the link at the post is not available anymore. Would you please email me the recipe? Thank you so much! You’re an talented baker! How many cupcakes should this recipe make? This is such a gorgeous cake and I just had to bookmark this page right away!!! I’ll be making this, but sadly my hubby is allergic to creamcheese, and I just don’t know what else I can use? Please help! I’d love to surprise him with such a beautiful cake, as he’s allergic to a lot of things and he can’t eat much, it’s sad, so this would be so perfect! Did though have a problem with the chocolate ganache though, as it was simply too thick, and once cooled I couldn’t pour it. So I remelted it and added more condensed milk so when it would cool off it would be more liquid. It was still too thick but at least somehow to be managed. This did turn though in a bit too of a thick layer on the sides and not looking visually as stunning as I hoped. I suspect this might be due to the kind of white chocolate I bought. The cake was enjoyed by the guest very much. As I am a big fan of Raffaello, I was expecting a light cake with a similar taste. The cake was though much much sweeter and denser compared to the light Raffaellos one can buy. The good part is that with such a dense cake one can only eat a tiny tiny slice and will be full, therefor it is appropriate for many guests for a small quantity, or, in our case we froze the remaining cake and plan to defrost it when we have impromptu guests and serve them with some coffee and this tasty cake. This cake looks perfect. I want to make this cake for the next birthday we have but I don’t know what tartar is? I am Dutch and can’t figure it out online. In het ingridients is a teaspoon cream or tartar. What is it? Is it just whipped cream? And what is tartar? Im dutch and can find the translation on the internet. That is a good questions, cream of tartar is actually a powder and it is hard to find in Europe. In Germany it is called ‘Weinstein’ but I am not sure where to get it. I am sorry if that was not much help! Maybe you can ask at the grocery store, or find it on amazon? You can actually leave it out and it should still work, it just helps stabilize the egg whites. I am obsessed with desserts! Definitely your sky high raffaello cake are awesomeness! This is a great recipe Melina, as you know I made it a short while ago and it was lovely, in fact have made it again since. Thanks for sharing! I love the idea of this recipe but am SO allergic to coconut. Can I omit the coconut flakes without impairing the cake & substitute orange flavor (orange oil and/or orange extract) for the coconut & use pecans in place of almonds since I too live in TX where the oranges & pecans are plentiful and home-grown? Thank you for your help! I surely do miss the time we spent in Germany as US Army folks, especially the morning brochen & lunch German potato salad! Smiles. I made this for my sons 1st birthday, I doubled the cake mixture and spread it across 3x8inch tins. I don’t think it rose as much as it was supposed to but I still got 6 layers out of it. I didn’t double the buttercream and still had some left over. The cake was delicious and many adults were coming back for seconds. I was daunted at the task of making this initially but I will make again now I have mastered it once. I was wondering if you could give more detail on step 2. I wisked the egg whites slightly but maybe if I had done this more my cakes would have been fluffier? Looks wonderful! What am I missing in the buttercream recipe? The recipe calls for 300g granulated sugar but I only see directions for using 50g. Definitely, your sky-high Raffaello cake is awesomeness! This is a great recipe, as you know I made it a short while ago and it was lovely, in fact, have made it again since. Thanks for sharing!